The Connecticut Charter Oak, what a story! It is Memorial Day weekend and I am reminded that we are celebrating freedoms earned my many Connecticut citizens. I am in awe of the strength, ingenuity, wit and talents of the Connecticut people. Through our colorful and remarkable history we have become a state of resources but we were first a state of determination to live free. One of our state stories is of legendary proportion. The story of the Charter Oak. Connecticut was established and granted a charter to govern by. It was a document quite liberal in its day and provided the people with the framework for the new society here far from mother England. As the young colony stretched her wings and grew the powers sought to rein in the unruly colonists and recalled the charter. A meeting was held in Hartford and the leading officials of the colony gathered around the document that represented their freedoms. It lay on a candlelit table for scrutiny by all. In the midst of the meeting where some respected England’s wishes and wanted to return the charter and others felt strongly to never relinquish rights given. During the heated meeting the candles were suddenly extinguished by a breeze or opened window. The darkness was complete there was a shuffling and tumble of chaos in the room and when light was eventually reignited the Charter was gone. Patriots had swept it off the table in a daring plan to preserve their rights to govern. The document was gone! Now a part of Connecticut history the charter was hidden in the hollow of a great oak tree. Deep inside the oak tree, a known representative of strength was the paper that insured Connecticut freedoms and rights. It was the first move by the young colonies to break away from England and precipitated much thought and argument about loyalty to the crown. Connecticut’s Charter Oak was honored as the protective tree that ensured our liberties. Many many years later as a violent storm swept through Connecticut the tree met its fate and crashed to the earth. So revered for her strength and role in our independence that some of the wood was used to make the chair that the state senate leader sits on. Over the years many people had collected acorns from under the Charter Oak and planted them about the state a symbol of the historical moment. Many of these trees are noted with a historical marker and still today people collect a few acorns and undertake the growing of the next generation of Charter Oak. 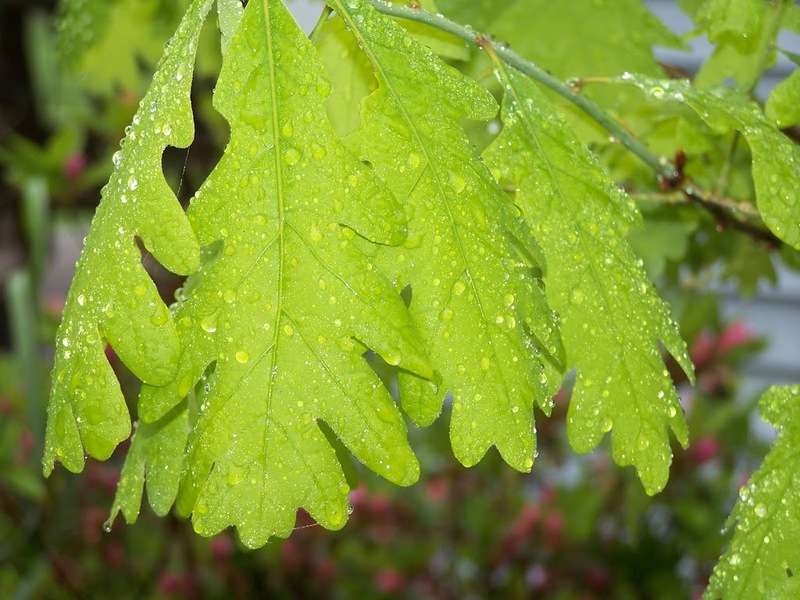 The photo of wet spring rain on Charter oak leaves is in my yard. This young tree is ready to move on to a place of distinction. It has grown from a tiny little sprig and now is strong enough to make the move into the open. I have a larger one I nurtured in my flower bed now established in the midst of the front yard. 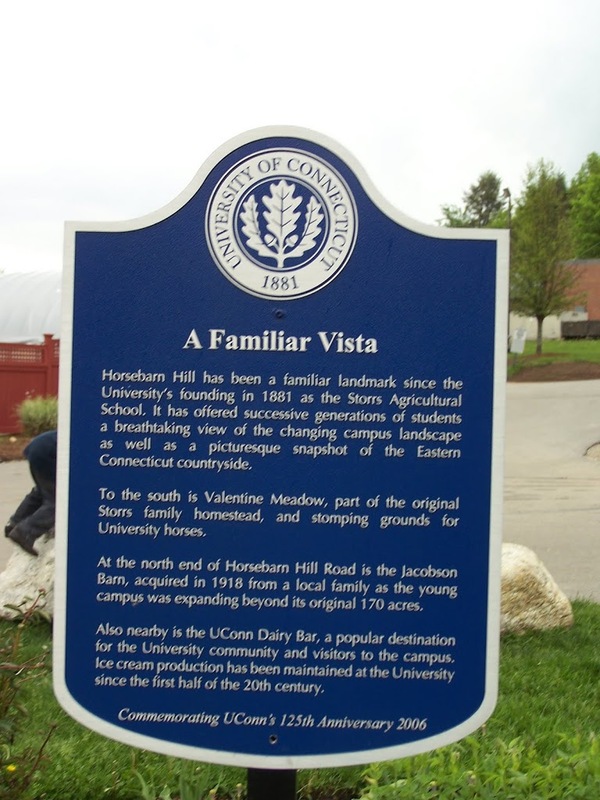 Someday its large branches will throw shade on the pasture, house a multitude of bird nests and remind us of the sacrifices made in Connecticut’s infancy. When I share Connecticut history storytelling I often will tell about the Charter Oak. 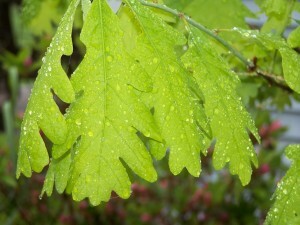 Many people are still unaware of the reason the oak leaf is a common Connecticut symbol. We can continue to promote the freedoms the colonists felt so strong about preserving in that early charter by remembering and sharing the story of the Connecticut Charter Oak. 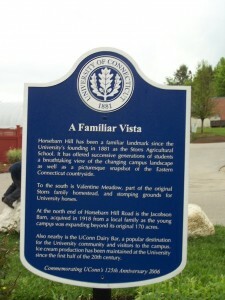 Note in the sign below from the University of Connecticut the use of the Charter Oak symbolism. Temple Grandin Returns to CT.